By now you’ve learned many Thai curry pastes and a lot of curries. We are up to episode 18! Did you realize that? Beware that the Thai curry can go beyond hundred episodes and no one can cancel this show. 😉 All the basics and advanced curry pastes are now covered. I left out only a soup that doesn’t use chili in the curry paste, and you probably don’t know of it anyway. The soup is called Kaeng Liang. If anyone really wants the recipe, let me know on my Facebook page and I will provide it. It’s not my favorite soup and one of the ingredients is hard to find, so I can only give the recipe in the summertime. I can now introduce you to the many different ways of using Thai curry pastes to make many different dishes. 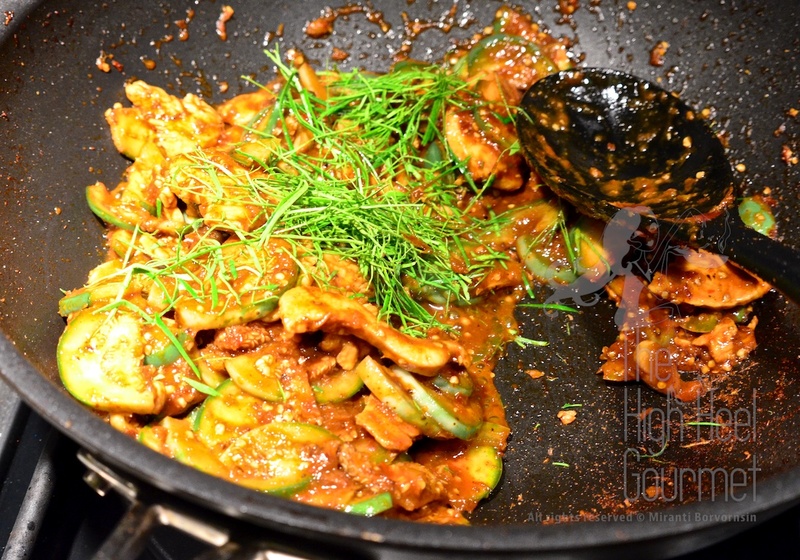 Most of the time the Thais will be making their curries using one type of vegetables and one type of meat. This is not a rule, but it’s more like the norm. We don’t put five different vegetables in our curries the way they do here, except in Kaeng Liang or Kaeng Som, which are clearly the Thai mixed vegetable soups. The typical “red curry” or “green curry” in Thai restaurants in the US and the rest of the world are normally packed with at least two or three kinds of vegetables, and also not even the type of vegetable that we would use in Thailand either. Frankly, I don’t eat them. I almost never order curry at a restaurant. I like my curry with one kind of vegetable, unlike my salad where I usually mix all the vegetables together. I think I’m just not used to seeing a coconut milk-based curry with the whole garden in it. It reminds me of pig food, haha. Well, they do feed pigs with leftover food, of course with EVERYTHING is mixed together, so it’s unappealing to me. I don’t genuinely think there is anything wrong with that, though, just not very appertizing looking to me, that’s all. A lot of times people ask me if they can put this and that vegetable in a Thai curry. My answer usually is, “Yes, you can.” The idea of Thai curry is to use whatever meat and vegetable is readily available at hand. You don’t have to go all the way to the Asian market to buy Asian vegetables to put in your curry. You should be able to look in your vegetable drawer in your fridge, and whatever’s in there should be good enough. This time I had Thai eggplant left over from the Kaeng Pa and also some Kaeng Pa curry paste left. I didn’t want to make Kaeng Pa again so I decided to make Pad Phed Gai. 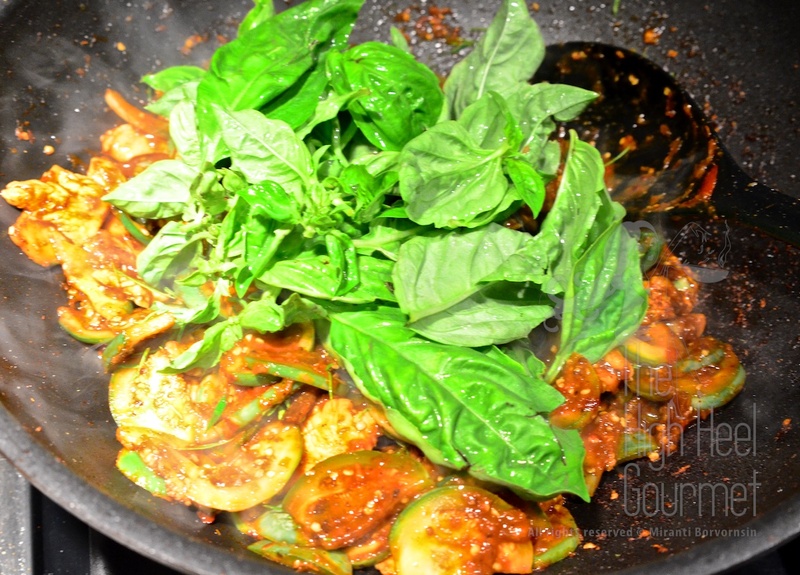 Pad Phed is a stir fried curry dish similar to Pad Phrik Khing but using the Kaeng Pa or Kaeng Phed curry paste instead of Kaeng Kua. Remember the difference I explained to you in the Advance curry paste episode? 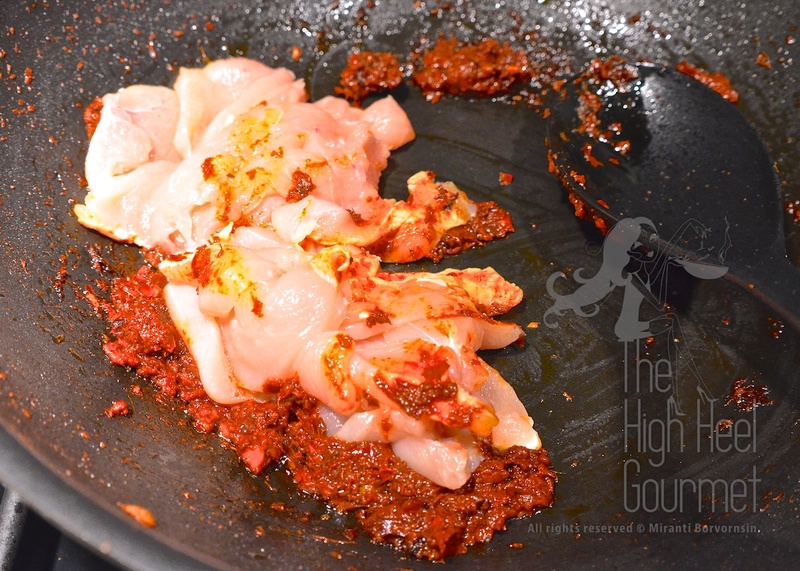 Kaeng Phed has more spice, cumin and coriander added to the Kaeng Kua (basic red curry paste) curry paste. Kaeng Pa is the same, except Kaeng Pa might have fresh chili in the curry paste and the texture of the curry paste is not fine ground like Kaeng Phed, which is better suited for stir-frying. If you’ve ever been to Thailand, you might have eaten a Pad Phed with bamboo shoots and chicken. 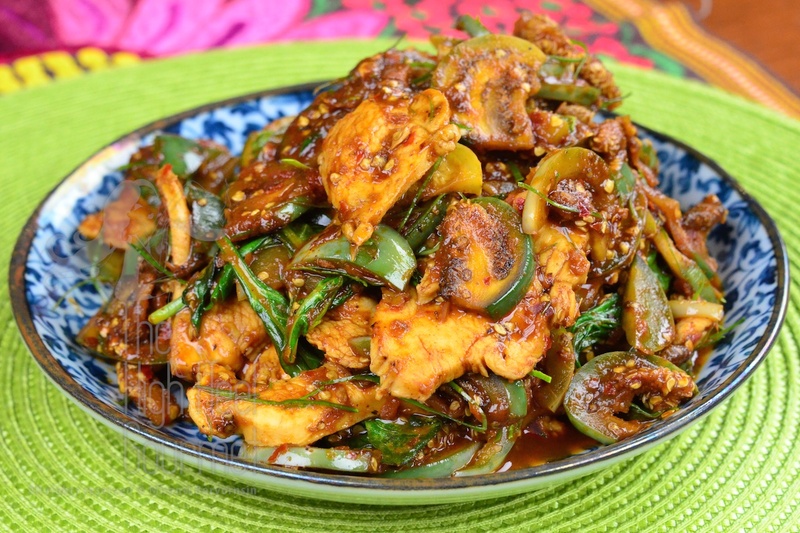 Pad means stir-fried, Phed means spicy and Gai=Chicken, that simple. This dish is very similar to the most popular Pad Phed, the Pad Phed Gai with Bamboo Shoots, but I had eggplant left over, so I substituted the bamboo shoot with the eggplant. 1) Put oil in the pan over medium heat, wait until the oil gets hot, add the curry paste, then stir fry for two minutes until the curry paste is fragrant. 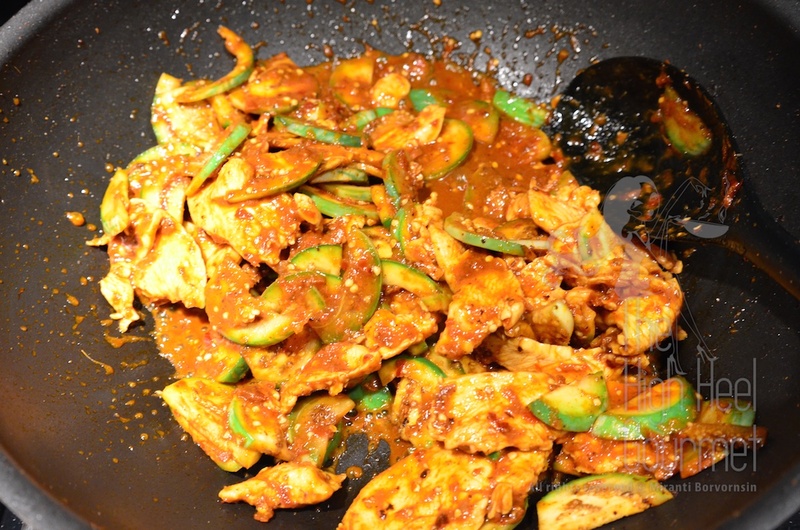 2) Add the chicken, increase the heat to high, add half of the fish sauce, salt and half of the sugar, and stir fry until the chicken looks done. stir fry until the eggplants are cooked to your preference. I like them semi-soft but other people like them crunchy. Taste test it and adjust to your preference. You can also add more water to keep them from drying. and turn off the heat before you add the basil. This is good with a Thai Jasmine rice, traditionally, but I found that it’s great with pasta too. Just boil the pasta, or if you want to make your own fresh pasta you can, just blanch it briefly before you stir fry into the Pad Phed. You can also add peppercorns if you like. Enjoy! 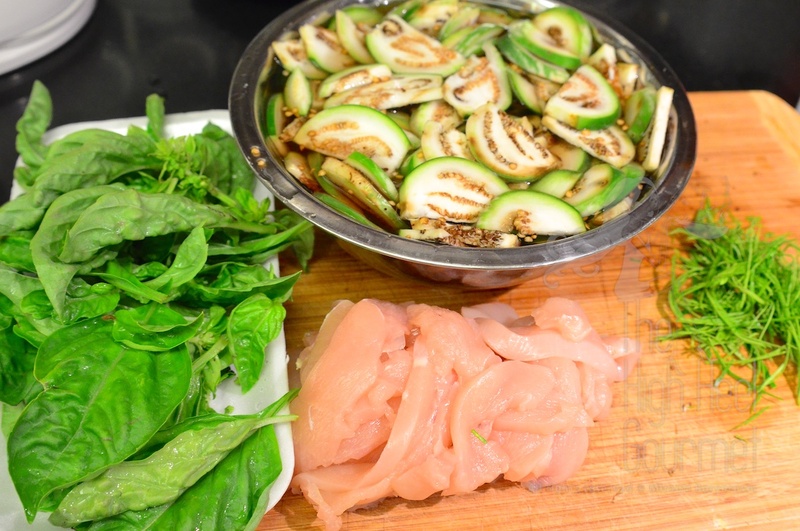 This entry was posted in Chicken, Clicking in the Kitchen, Dinner, Gluten Free, Healthy Food, Lunch, Stir fry, Thai, Thai Curry Paste, Vegetable and tagged Asian, Chicken, Cooking, Curry, Easy recipes, Food, gluten free, Recipe, Thai Curry Paste, Thai food. Bookmark the permalink. Hi. I love this recipe but oftentimes I find the Thai eggplants I buy in Wisconsin to be extremely seedy. Can you advise on how to identify the good ones? Thanks. The seedy eggplants are the older one. I tend to look for the smaller size. This is not necessary the right way but at the least, I got more young one. Love your blog! I hate cooking with substitutes so I am a big fan when you say ” if you can’t get x ingredient, don’t try cooking this!” One question…you say in your method to add half the sugar and Nam Pla. What about the rest of it? You add half first then taste test it. Once you figure out the taste, add the rest according to your preference. I don’t want you to add everything and found out that it too salty or sweet beyond correction. Never cancel the show!!! You need to write a cookbook. I love your style and attitude! Really nice. Such a spectacular looking dish of food. You should make this, Conor. I made it last night and it was delicious. 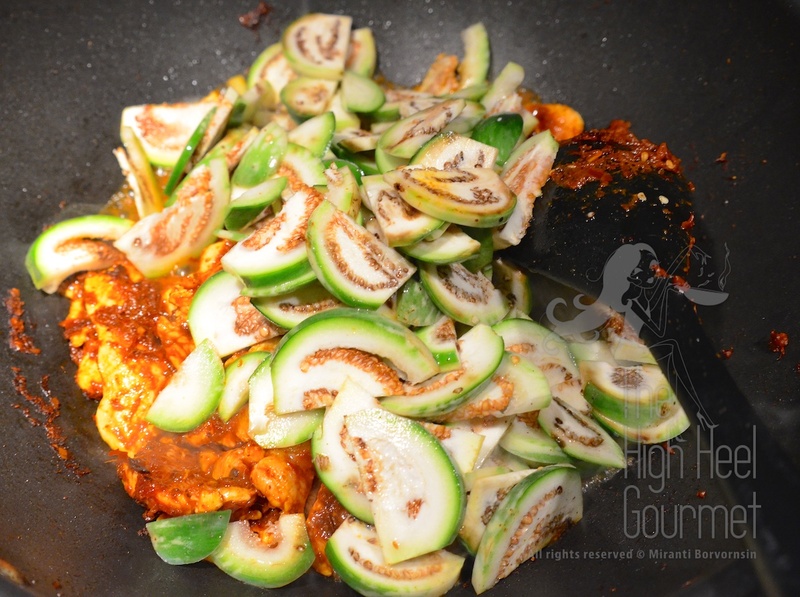 The eggplant soaks up the flavors very well and the flavors really worked together. Of course I used chicken thigh meat instead of breast. I’m going to do a blog post about it soon. I’m glad you like it. You can also use the regular purple eggplants too. is it holy basil or other basil? Sweet basil or Thai basil but I used Italian basil this time. It works too. Thank you so much for being that strict. That is real thai cooking. can i sub w/ red curry paste instead, or where to get kaeng pa? Of course red curry paste works too. Beautiful color contrasts in the finished dish.